So many different feats have been achieved by humans with bicycles over the years. Some of them (a handful actually), recognized by the Guinness Book Of World Records, have been collected by me today and posted here for your viewing. 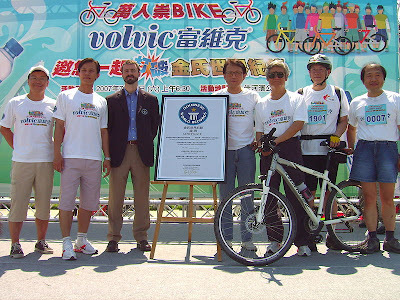 Volvic Taiwan, Da Jia Jenn Lann Temple and Taichung County Government together organized an event that broke the record for the largest bicycle parade on March 1, 2008. 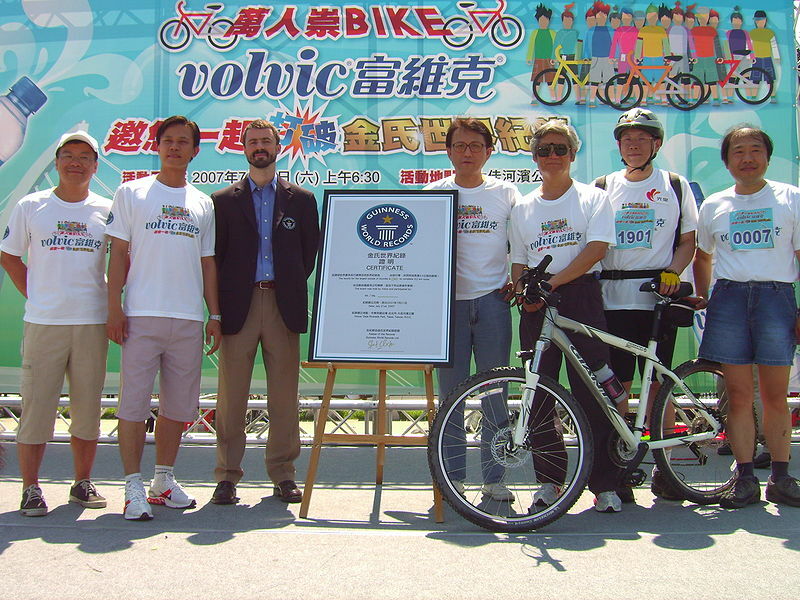 A total of 2,152 bicyclists participated in the "Ten Thousand People for BIKE" challenge. The record for the most people static cycling is 412 and was achieved by Esporta Health & Fitness (UK) during their annual conference in Gloucester, UK, on 19 February 2009. 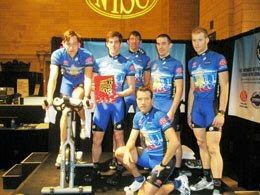 On 19 January 2008, the New York Sports Clubs/Cadence Cycling Team – consisting of Tucker Brown, Chad Butts, Holden Comeau, Mikael Hanson, Thomas Wood (all USA) and Stefan Kusurelis (Germany) rode a Guiness World Record total of 1,335.5 km (829.84 miles) on a spinning bike, which means that the team cycled at an average pace of 55.65 km/h (or 34.58 mph). 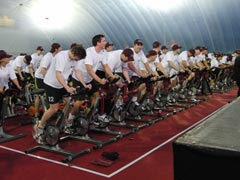 The record for the greatest distance on a static cycle in one hour by an individual is 65.48 km (40.69 miles) and was achieved by Holden Comeau (USA) from the same team, that same day. The records were broken during New York Sports Clubs' Saints and Spinners event, a 24-hour Spin[R]-a-Thon benefit in New York's iconic Grand Central Terminal. George E. Hood of Naperville, Illinois spent 177 hours 45 minutes on a stationary bike at the Fry Family YMCA to pedal a total of 2616.35 miles. 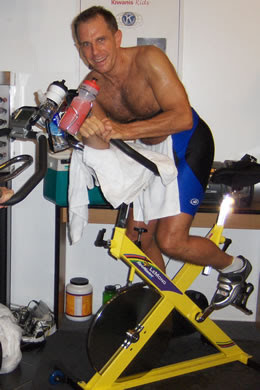 The previous marathon static cycling record broken was 175 hours 50 minutes. And you thought sitting on your trainer for 2 hours was an achievement. Take a look at the video of this achievement here on CNN iReport. The furthest distance static cycling in one minute is 2,040 metres (1.27 miles) and was achieved by Miguel Angel Castro (Spain), in Villa de Arafo, Tenerife, Spain, on 26 August 2009. Check out the record breaking video below. 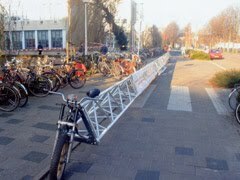 The longest true bicycle, i,e one with only two wheels and no stabilizers, was 28.1 m (92 ft 2 in) long and was built by members of Gezelschap Leeghwater, the mechanical engineering students' association at Delft University of Technology. The bicycle was ridden for a distance in excess of 100 m (328 ft) at Delft, The Netherlands, on December 11, 2002. The deepest cycling underwater is 66.5 meters (214 feet, 10 inches) and was achieved by Vittorio Innocente in Santa Margherita Ligure, Liguria, Italy, on July 21, 2008. The heaviest weight pulled with the eye sockets is 411.65 kilograms (907 pounds) and was achieved by The Space Cowboy, aka Chayne Hultgren of Australia, on the set of "Lo Show Dei Record" in Milan, Italy, on April 25, 2009. Apparently, all the weight was on a bicycle! Or were there three wheels to it? Sam Wakeling covered 453.6 kilometers (281.85 miles) on a unicycle in a 24-hour period at Aberystwyth, Wales, United Kingdom, from Sept. 29-30, 2007. 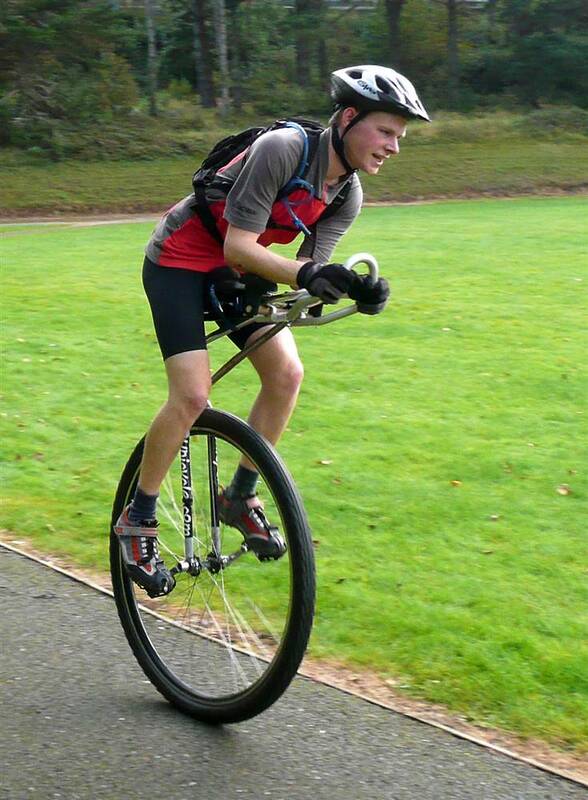 Okay, a unicycle may not be a bicycle but this is still worthy of mention. And How About Cycling Backwards Across The United States! 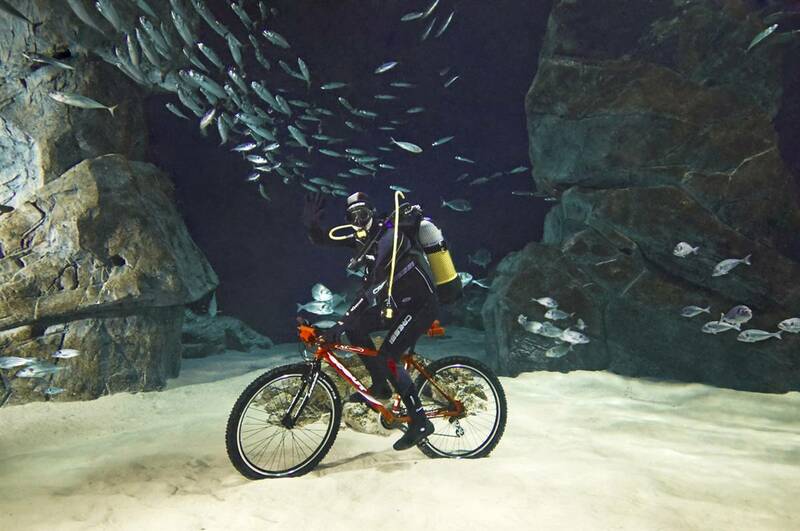 Numerous other remarkable human feats on bicycles have been achieved. Some of them have gone on without being recognized by Guinness. For example, I want you to see the following which may strike you as absolutely bizarre, maybe even impossible. Curan Wright, a 38 year old man from California has been riding his bicycle backwards from 2007. His 20 inch bicycle is specially designed to ride backwards. His aim is to cover the entire U.S, coast to coast, to raise awareness for HIV/AIDS, homelessness and hmm...the medicinal use of marijuana. He's already covered 5300 miles riding backwards and still hasn't finished this project. Curan Wright's Website, "Riding Backwards"
Like the underwater one the most! Asb : While the records on static bike may look pointless, what I didn't mention is that all that effort is being converted to money for charity and so on, so its probably considered a worthwhile cause for the people who undertake such a task. George Hood could barely walk after being lifted out of his static bike after the 177 hour effort and had to be helped to a bed. As for your question what would be the most "efficient" setup to convert human energy to max pedal power, I think it depends on the individual riding and the conditions. Generally, I don't think it should be a bike that costs more resources in terms of lower and upper body musculature, because that translates to more oxygen consumption for the individual. A static bike in which the pedaller is upright makes sense because gravity is aiding some of the effort (think of long distance birds gliding in the wind on top of currents of air, I think that is efficient). For outdoors, riding upright might be considered heresy for aerodynamic drag reduction. Hence people have gone recumbent and Sam Whittingham has broken the speed records going one tenth the speed of sound, but I'm not sure if he broke any records on the power scale. I've always wanted to see how a seriously muscled individual, fast-twitch muscled by genetics (perhaps an African American?) will do sprinting on a trainer with maximum effort. For the record, the projected power vs duration curve for world class cyclists in the Book High Tech Cycling maxes out at 1200 Watts in 0.2 minutes or something like that. I wonder if that's the absolute upper limit for humans? Same plot shows Eddy Merckx did almost 500 Watts on an ergometer in 50 minutes and no one we've heard of has broken that limit either. See Linkfor reference.